With each new set, new cards enter Modern, and it’s been the case for the past few years that new sets impact the format in some way. Dominaria is no different; the expansion contains a few cards sure to succeed in the format, as well as some enigmas and some clearly overrated cards. In this article, we’ll review cards in all three groups. I’m confident these cards will see Modern play in some capacity. We’ll start with the card I personally am most excited about. Unlike Sorcerous Spyglass, the last newcomer that had me stoked for applications in Colorless Eldrazi Stompy, Zhalfirin Void actually kills in that deck—and this time, I’ve done the preliminary testing to know for sure. The card is an auto-include at 2 in that deck and very likely deserves a couple more slots. 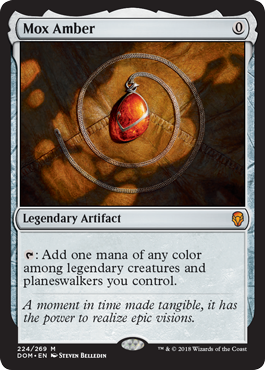 Next, we’ll look at the card everyone else is most excited about: Damping Sphere. The Modern community went wild when this card was revealed to be just uncommon, since it boasts a great effect for very little cost—and is eminently splashable, to boot! Literally any deck looking for some quick-and-dirty percentage points against Tron and Storm can throw a couple of these into their sideboard, meaning demand for the uncommon is likely to start and remain high (not Fatal Push-high, mind you). 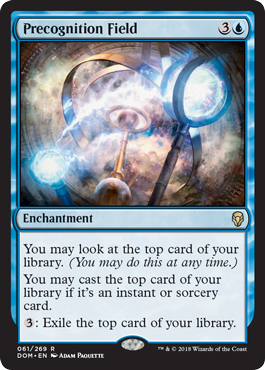 Having it at uncommon ensures more players will be able to get their hands on them faster, so Tron players, expect to see plenty of Spheres as soon as Dominaria becomes legal. Sphere’s artifact typing does make it vulnerable to hate. Both Tron and Storm pack artifact removal in the sideboard, but I like Sphere better against the former deck; Nature’s Claim already dealt with Blood Moon, and the two-mana Sphere is a smaller mana investment. Against Storm, though, Sphere pales in comparison to more surgical options like Eidolon of Rhetoric, Rest in Peace, or Rule of Law; it’s a lot harder for the UR deck to remove enchantments than artifacts. That said, Sphere has so much coverage against Modern’s linear decks that I expect it to win out over narrower alternatives in most sideboards. I do think some folks are overrating Sphere’s role in Modern. The card seems to do very little against Eldrazi strategies, for instance. Paying two mana to turn a Temple into a Wastes is just worse than Spreading Seas, and certainly not worth a card; the point of Eldrazi decks in general (but mostly of Eldrazi Tron) is that they can execute their primary gameplan through heavy-duty nonbasic hate like Blood Moon, or now Damping Sphere. Another new toy that has my attention is Precognition Field, which I’ve already experimented with in a variety of aggro-control shells. Like Jace, the Mind Sculptor, Field represents a full can of card advantage in one four-mana package. It doesn’t require mana to function once cast, either, since Jace too makes pilots pay for the spells he draws. 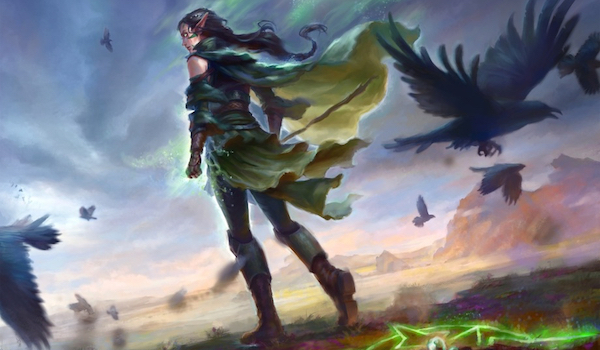 While Field’s advantage is more conditional and requires decks to be built a certain way—it obviously doesn’t fit into the Collected Company decks we’ve seen sometimes adopt the planeswalker—it’s a great deal more robust. Enchantments are notoriously difficult to remove in Modern, and this one dodges Abrupt Decay, leaving pretty much just Maelstrom Pulse and Detention Sphere as feasible answers. Sticking Jace can prove tricky for blue decks, since the walker can be Bolted or attacked and therefore requires a very specific timing window. 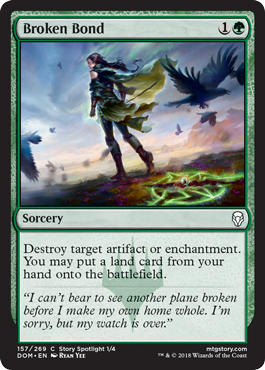 Not so with Field, which only asks pilots to not outright die on the following turn. I bet Broken Bond finds a home in a specific type of big mana deck that runs a lot of lands and relies on putting them into play quickly. That excludes the land-light, cantrip-heavy Tron, as well as the creature-centric Eldrazi decks. Rather, Bond seems tailor-made for RG Valakut and maybe Amulet Titan. Both of these decks struggle to defeat a resolved Blood Moon, and Leyline of Sanctity’s no picnic, either. So they’ve always run enchantment removal in the side, be it Nature’s Claim or Seal of Primordium. Bond’s upside is relevant so much of the time in these land-heavy decks that I’d be surprised if they don’t just make a clean switch. These cards strike me as having Modern potential, but they either lack obvious homes or fit into decks with shaky track records. Perhaps the most puzzling card in the set, Mox Amber has bewildered Modern players to the point of abandon. Some brave souls have tried to make it work, though. David’s impressions of the card were bleak, but I think it has potential in the right shell. Modern is all about fast mana, after all. I’m excited to see which decks adopt Mox Amber, even if it takes a year or two. 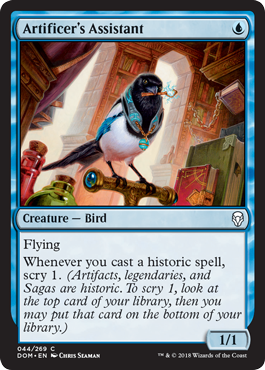 One of the newer cards spoiled, Artificer’s Assistant is a Flying Men with significant upside in decks that cast many artifacts. I can imagine accumulating upwards of 15 scrys in Ironworks Combo helps the likes of Chromatic Sphere draw into critical pieces more often, but the bird doesn’t directly contribute to any synergies there, so I don’t know if it belongs. Even more tenuous is the idea of Assistant in a deck like Lantern Control or Affinity, which quickly dump their hands, don’t need scry effects, and have access to Glint-Nest Crane as a superior option. I’m still tickled by the idea of Assistant in Blue Steel, though, where it bottoms weaker draws to find heavy-hitting closers and otherwise synergizes with the gameplan thanks to its cheap, evasive, blue body. Counterspell and Lightning Bolt are some of the most iconic Magic cards of all time, and in some ways, Modern cards—players have clamored for a straight reprint of the former for years, while analogs Logic Knot and Deprive have seen intermittent play over the format’s lifespan. In Dominaria, the pair are reborn as the tribe-specific Wizard’s Retort and Wizard’s Lightning. I’ve messed around with Wizard decks in Modern before (for no particualr reason), and so was excited to test Retort and Lightning. Their performance pleasantly surprised me, and I wonder if an actual Wizards deck won’t spring up in Modern to abuse the new instants with Snapcaster Mage. 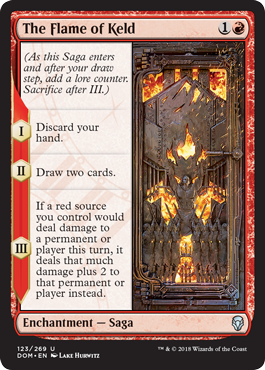 The final card in our maybes is The Flame of Keld, which on its surface looks like it could do something in Burn. I think its conditions are too hard to meet in that deck, though. Sure, there are plenty of instances where Burn will wish it could topdeck Flame, but also plenty where Flames actually in the deck will cost it the game. Burn needs a critical mass of spells that do the exact same thing, and Flame does something different. Flame is more appealing out of the sideboard, where it attacks decks like Jund pretty effectively. These decks tend to stall Burn out at 7 life or so and then kill them with a Goyf as it draws lands. Of course, Shrine of Burning Rage does something similar, and has the added bonus of getting through roadblocks like Chalice of the Void. These cards have generated hype I recommend against believing. As of Dominaria, any deck in the format can spend four mana for a heap of loyalty. But loyalty’s not worth much in Modern, and neither are clunky card advantage engines. After all, ours is a format defined by Dark Confidant, Urza’s Tower, and Temur Battle Rage. 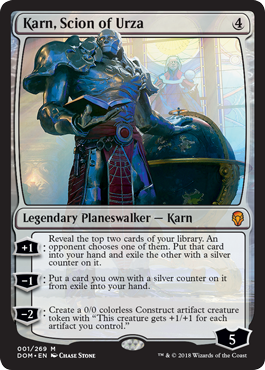 Karn, Scion of Urza‘s biggest failing, though, is that it doesn’t outperform anything. Modern has a vast enough card pool at this point that pretty much every deck in existence has better card advantage engine options than Karn at four mana, especially with Jace, the Mind Sculptor now in the format. Most are colored, sure, but so are most decks. The few that aren’t undeniably have no use for this guy. Four mana for a 7/7 trample is a pretty good rate, so naturally Traxos comes with a drawback. And in Modern, that drawback isn’t even so significant—players can easily build decks that cast heroic spells each turn should an adequate payoff demand it. But in this Construct’s case, the payoff simply isn’t big enough to warrant that kind of deckbuilding. Traxos’s biggest weakness lies in its typing. Kolaghan’s Command and Ancient Grudge are the biggest obstacles to its playability outside of just Fatal Push. Where Hollow One naturally dodges the ubiquitous black instant and exists in decks that otherwise ignore artifact removal, Traxos all but requires a shell naturally weak to artifact hate already, increasing the odds opponents have some handy after its conditions have been met. All that fragility on a card that doesn’t impact the board the turn it comes down bodes ill for this card’s future in Modern. I’ve heard murmurings about this card in Jund as a way to fire off Liliana of the Veil‘s ultimate the turn after she comes down, but nah. Jund is not a combo deck, and has little interest in firing off Lili ultimates as fast as possible. It’s an aggressive attrition deck that takes its time chewing through opposing resources so that it can take over the game with Tarmogoyf or a manland. 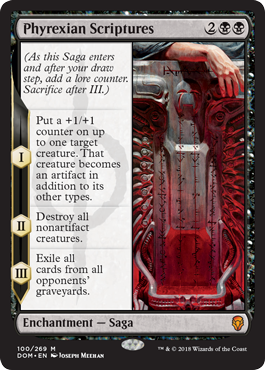 The second of two sagas in this article, Phyrexian Scriptures plays like a Damnation with “suspend 1”. On its own, that’s pretty unimpressive, but Scriptures does leave one of its caster’s threats alive, and incidentally hates on the graveyard. As is the case with many fair-looking cards entering Modern from Standard, the exciting aspect of Scriptures lies in its abuse potential. Since its big mode is on II and not III, removing a counter from the enchantment somehow gives players access to repeated Wrath effects, all while their newly christened artifact beats down. The most obvious way to achieve this combo is with Hex Parasite, itself an artifact that won’t die to the sweep. Parasite can also remove multiple lore counters from Scriptures to buff itself with a +1/+1 counter should opponents hold off on playing threats into an impending Wrath of God effect. While charming, I don’t think this combo can actually survive in Modern. But I’d keep an eye on Hex Parasite. The way Wizards designed the sagas makes me think the metal insect could break something eventually. Besides the new Modern cards, Dominaria is dripping with throwback flavor, and I can’t wait to get my hands on some of its awesome uncommons. Which cards from the set have you the most excited? Let me know in the comments. I’m gonna put in a good word for the Merfolk Trickster. That card is going to improve Merfolk’s matchups against the field by virtue of being pretty much unconditionally good. And it’s also a Wizard, so it might have some crossover appeal. I also think Naban, Dean of Iteration might be worth a look. I’ve been thinking about it replacing The singleton tasigur in the more scour focused version of traverse shadow. It can easily pay UU to cast it, and removing a blocker on a critical turn is about the floor for it, It can also kill goyfs and act as a 3rd but worse TBR targeting shadow after it swings to get in for 13. Tasi has been feeling worse and worse as fewer decks are completely reliant on push now. Wow, targeting Shadow is really cool! Reread the card. Won’t let you target your own creatures, but it’s still been over-performing even without that ability. Something to note about Wizard’s Retort is that it’s always UU when flashed back with a Snapcaster. It might be good enough to play in any Snapcaster deck (i.e. just about any interactive blue deck) and not need a dedicated Wizard tribal shell. Moreover, a lot of Merfolk are Wizards, including Cursecatcher. Not if opponents kill Snap in response to the target! Merfolk is privy to running Unified Will in the sideboard, which to its credit casts off Mutavault, but that’s maybe something to consider as well. Correct me if I’m wrong, but, Snap gives flashback equal to the card’s mana cost. He doesn’t work with cost reducing effects such as this. You’re wrong! Snapcaster only “doesn’t work” with alternate costs, such as FoW or Disrupting Shoal, since flashback is also an alternate cost. You can only pay with one alternate cost at a time. Retort and Lightning, like Treasure Cruise or Goblin Electromancer, simply reduce how much the spell costs to cast, no matter where it’s cast from or how. Another interesting, but utterly marginal, use for Damping Sphere is turning Utopia Sprawled Forests into Wastes. Does it work that way? I would think sprawl is a triggered mana ability and not a replacement effect, so the land is tapped for one mana and the trigger adds another mana, not the actual land, so sphere would not affect it. As I understand it Utopia Sprawl modifies the enchanted Forest’s mana ability, adding an additional mana of the chosen color alongside the normal mana. I don’t think this is correct. Newer Wild Growth effects like Sheltered Aerie give the land an additional mana ability (“Enchanted land has…”) but Utopia Sprawl uses the original Wild Growth template (“Whenever enchanted land is tapped for mana…”) under which the source of the additional mana is the aura, not the land. As I understand it, the land auras with the newer template are affected by Damping Sphere, but ones with the older template aren’t. Wouldn’t really call that a use since Sphere would never (right?) come in against Ponza. I’m pretty sure it is a triggered ability since it says «when» –> effect. A replacement effect would say «if» –> «instead» –> effect. Tapping the land does not cause the land to add an additional mana to your pool, it triggers the mana ability of sprawl which adds the mana to your pool. So it doesn’t work the way you think it does. The mana come from sprawl’s ability, not the land. It hoses plenty of tier 2-3 decks, but Tron and Storm are the most obvious/popular targets for Sphere. Only have so much word space!